Prince Maurice of Battenberg, KCVO, (Maurice Victor Donald; 3 October 1891 - 27 October 1914) was a member of the Hessian princely Battenberg family and the extended British Royal Family, a grandson of Queen Victoria and her youngest grandchild. He was known as Prince Maurice of Battenberg throughout his life, as he died before the British Royal Family relinquished their German titles during World War I and changed their name to Mountbatten. Prince Maurice was born on 3 October 1891. He was given the name Maurice after his father Prince Henry of Battenberg and the great-grandfather, Count Maurice von Hauke, Victor after his grandmother the Queen, and Donald in honour of Scotland, as he was born at Balmoral Castle. His father was Prince Henry of Battenberg, the son of Prince Alexander of Hesse and by Rhine and Julie Therese n�e Countess Hauke. His mother was Princess Henry of Battenberg (n�e The Princess Beatrice of the United Kingdom), the fifth daughter and the youngest child of Queen Victoria and Albert, Prince Consort. As his father was the child of a morganatic marriage, Prince Henry of Battenberg took his style of Prince of Battenberg from his mother, Countess Julia Hauke who was created Princess of Battenberg in her own right. As such, Maurice was styled as His Serene Highness Prince Maurice of Battenberg from birth. In the United Kingdom, he was styled His Highness Prince Maurice of Battenberg under a Royal Warrant passed by Queen Victoria in 1886. The youngest of his four siblings, Maurice most resembled his father, who died when the Prince was only four, the same age his mother was when her own father died. He was his mother's favourite out of his brothers. He was educated at Lockers Park Prep School in Hertfordshire. 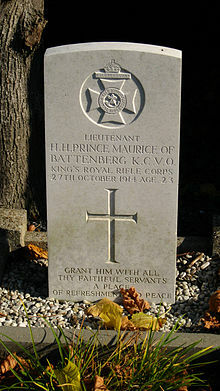 Picture - Grave of Prince Maurice of Battenberg in Ypres, Belgium. His elder sister Victoria Eugenie of Battenberg, married Alfonso XIII of Spain and was Queen Consort of Spain between 1906 and 1931. Maurice attended the prestigious Wellington College and was a member of the Benson House. The young Prince served in World War I as a lieutenant in the King's Royal Rifle Corps, and was killed in service in the Ypres Salient in 1914. He is buried in Ypres Town Commonwealth War Graves Commission Cemetery.